At Specktacular Home Remodeling, we have always put our clients comfort first. We are proud of the fact that we leave all job sites clean throughout the day by cleaning as we go, but take special care to clean our work areas at the end of each work day. Our team understands that remodeling can be stressful, so we try to make it as comfortable as we can for you by keeping our ‘mess’ as clean as possible while we work so you can continue with your daily lives. One common issue that clients can struggle with during a remodel is dust. Know that dust will be present in your home during any renovations, but can be managed if you work with the right company. In 2017, we began using a BuildClean HEPA Filter on our large construction sites. 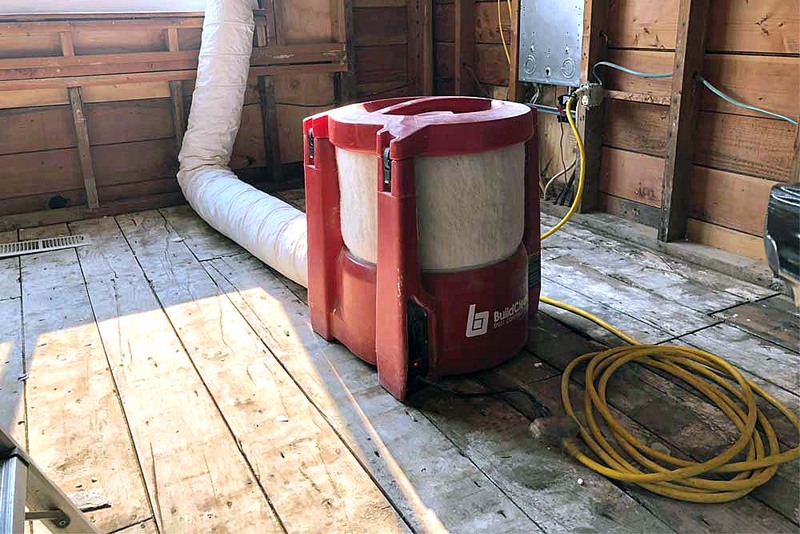 These BuildClean units are capable of removing up to 90% of airborne dust which dramatically improves the site livability for our clients and their pets, as well as the work environment for our employees and trades. The BuildClean safeguards against particles and irritants like crystalline silica and lead, and protects sensitive electronics like computers and TVs. We now have three BuildClean units we use throughout our company and we plan to continue using and investing in HEPA Filters because we have seen the difference it makes for our clients and employee comfort. In addition to our BuildClean units, we take the time to isolate our work areas whenever possible. This can be a simple as closing doors, but we find that is sometimes not enough. We will often plan to create temporary walls, designate a main entryway to the work area, and use poly sheeting to block living areas off during your project. No matter what remodeling company you use, though we do hope you choose to have a Specktacular experience, be sure there is a dust control plan in place with your contractor before your project begins.